This is an Absolute Auction. No minimum bid, no reserve price. Former Criss Insurance office building, at the corner of Main and Meridian in downtown Jasonville, Indiana. 20′ x 40′ office with parking space. Office furnishings sell separately. 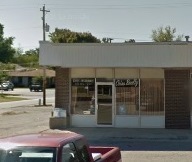 Real Estate: 112 W. Main St., Jasonville, Indiana. Former Criss Insurance office building. This is a 20’ x 40’ commercial space sitting on a 20’ x 120’ lot. The building is currently configured with 1 office, a waiting/receptionist area, work room, storage room & 1/2 bath. There is no minimum or reserve price for the sale of this real estate! Be sure to read the attached document which contains the complete purchase agreement. Real Estate: Buyer will submit a $500.00 earnest money deposit and sign a non-contingent purchase contract at the conclusion of the auction. Please read the attached document which includes the complete purchase agreement. Buyer will pay all costs involved in title work and closing the transaction. Estimated fees for the buyer are $1,300 if buyer does not use the property to secure a loan. Add approximately $350 to closing costs if buyer is using property to secure a loan. Closing will take place on or before May 21, 2018. Personal Property: Must be paid for in full at the conclusion of the auction and removed immediately. Please be sure to bookmark the Wells Auction & Realty website at http://www.wellsauctioncompany.com. Copyright © 2019 • Wells Auction & Realty • All Rights Reserved.